HP ProCurve Switch 5304xl - switch - Managed - rack-mountable 4-slot J4850A / B - J4852A / B - J4821A / B - Used"
The 4-port KVM switch ServSwitch DT Pro II is currently the most comprehensive desk-top Switch from Black Box. 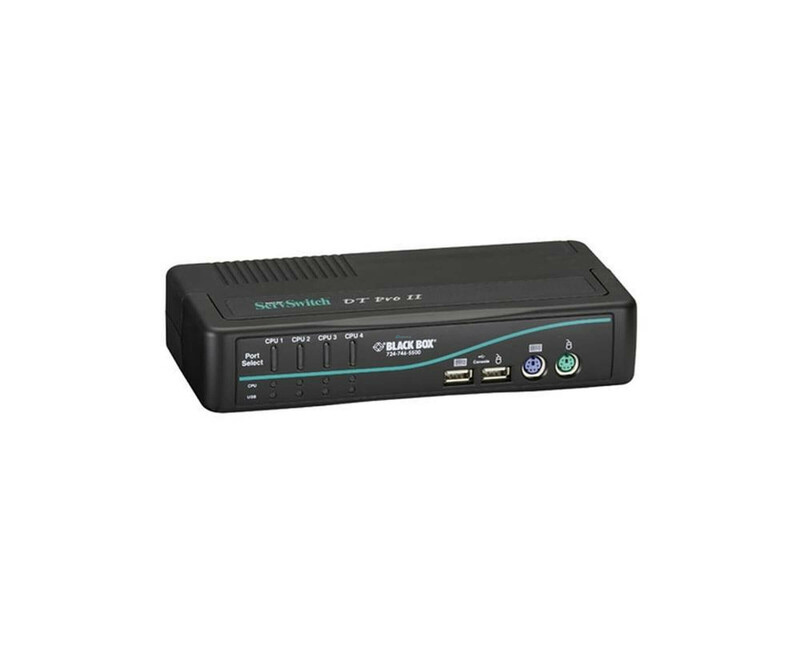 For this purpose, it is flexible: Use it to connect PS / 2 keyboard, monitor and mouse (KVM) to PS/2-PCs, USB KVM to PS/2-PCs, PS/2-KVM USB-PCs or USB KVM USB-PCs. About Short Path keys (keyboard Hotkeeys) You can switch the KVM control and USB devices even asynchronously. The Desktop Pro II supports Microsoft IntelliMouse and other mice, and the USB ports comply with the USB 2.0 requirements. In addition, you can connect audio and USB 2.0 peripheral devices to the KVM switch. The ServSwitch works with common operating systems such as Windows 98/ME/2000/XP/Vista/7, Windows NT, Linux, Novell NetWare and Mac OS. 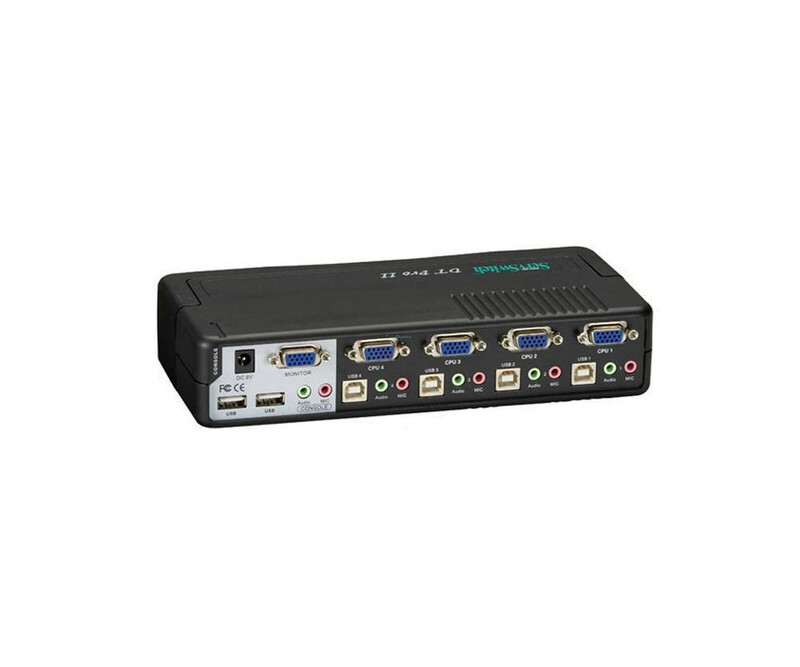 Der 4-Port KVM-Switch ServSwitch DT Pro II ist aktuell der umfangreichste Desk-top-Switch von Black Box. Dazu ist er flexibel: Verwenden Sie ihn zum Anschluss von PS/2 Tastatur, Monitor und Maus (KVM) an PS/2-PCs, USB-KVM an PS/2-PCs, PS/2-KVM an USB-PCs oder USB-KVM an USB-PCs. Über Kurzweg-tasten (Tastatur Hotkeeys) können Sie die KVM-Kontrolle und die USB-Geräte sogar asynchron umschalten. Der Desktop Pro II unterstützt die Microsoft IntelliMouse sowie andere Mäuse, und die USB-Ports erfüllen die USB 2.0-Anforderungen. Ausserdem können Sie Audio- und USB 2.0-Peripheriegeräte an den KVM-Switch anschliessen. Der ServSwitch arbeitet mit gängigen Betriebssystemen wie Windows 98/Me/2000/XP/Vista/7, Windows NT, Linux, Novell NetWare und Mac OS.